My wife and I decided to invest in these plantable see paper tags. Great coloring options. 100% eco-friendly even in the ink. Incredible. Really enjoyed the design process of my seed paper tags. It was a great company to work with. I will be back Custom Earth Promos. Loved the amount of coloring options I had on this product. Also liked how it was 100% eco-friendly and how you guys customized my companies logo that really stood out. Truly an eco-friendly product in all aspects, even down to the ink used in printing. They def made sure these tags were really imbedded with plenty of seeds. Its nice that the quality is so high. Really enjoyed the design process of my seed paper tags. It was a great company to work with. These seed paper tags have been a nice addition to out boutique, and allowed us to implement a more eco-friendly environment. 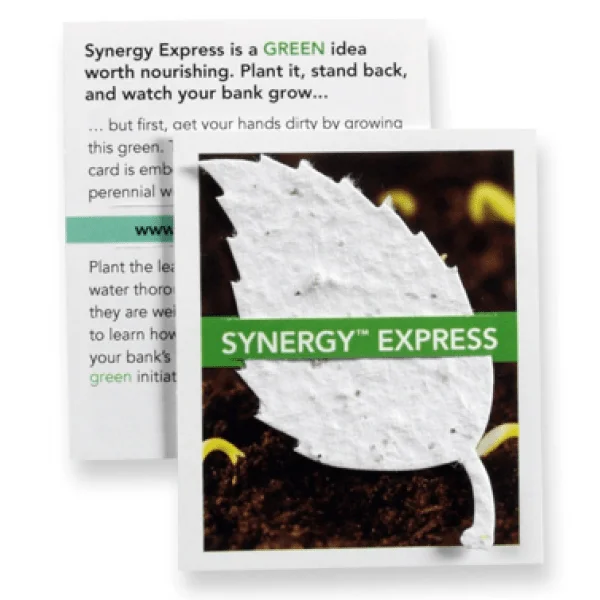 Your clients will always remember you and your business with these seed paper tags. A really cool, earth-friendly way to improve your exposure. I like that there are seed mixture options with this product. You aren't stuck to one option and thats really nice. We purchase these seed paper tags for our florist. It only made sense considering the tags are 100% Eco-friendly and can be planted. Was able to get really creative with my seed paper tags, I love the finished product. We couldn't be happier after receiving our seed paper tags for the store. I usually don't write reviews but the service from top to bottom warranted that I did. Thank you. Place an order for 10k seed paper tags. I'm confident these will be a great addition to our business. Refreshing that the entire tag is Eco-friendly and made out of recycled material. An added bonus to all the products we sell, with an Eco-friendly twist. Customizing these seed paper tags was a great experience. How neat that you can plant these seed paper tags. You will leave a lasting impression with all your clients. Custom Earth Promos really helped me get this order together and provided me with some real nice design options. Very pleasant to the eye. Being that these tags can be planted too was very motivating in regards to my purchase. Love, love, love this product. So cute and in line with my marketing mission. Just placed our order for 15,000 seed paper tags. It was an easy choice, with the all the help from Custom Earth Promos. Seed Paper Shape Tags from Custom Earth Promos are a widely adaptable, affordable and eco-friendly way to propel the success of your brand. Our seed paper shape tags cause no harm to the environment and even benefit the surrounding ecosystem when planted. Choose from over 100 seed paper shapes to most accurately complement your current campaign and work with one of our in-house design experts to build an exclusive cardstock graphic. 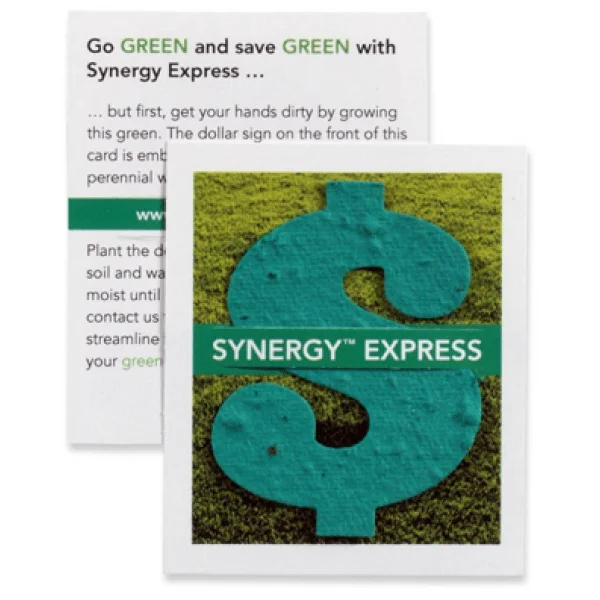 With the ability to personalize the cardstock graphics, seed paper color, shape and even seed mix, Custom Earth Promos invites customers of virtually any industry to build an exclusive seed paper tag design blueprint to establish or invest in their eco-responsible image. Custom sizes are available. Orders include full-color printing on one side. 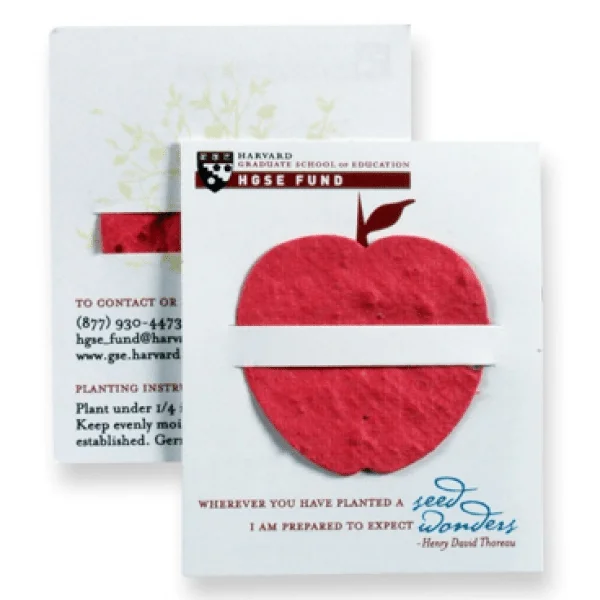 Cardstock is matched to the ready-to-plant seed paper shape of your choice. Choose from hundreds of stock, handmade seed paper shapes infused with our top performing, USDA-approved, non-GMO mix of wildflower seeds. When entire seed paper shape is planted under ¼" of soil, provided daily water and adequate care, colorful wildflowers will sprout in just 1-3 weeks! Establishing an environmentally responsible image is vital to keeping current customers, attracting future customers and gaining the attention of investors to increase market share. Clearly convey your brand's eco-awareness with a product sourced entirely from recycled materials. Not only do our seed paper shape tags cause no harm to the environment, they benefit the surrounding ecosystem when planted. Our seed paper tags are especially useful in promoting eco-friendly products, as they help spread your message more effectively. Custom Earth Promos can customize your order of seed paper tags by imprinting intricate designs and company logos. 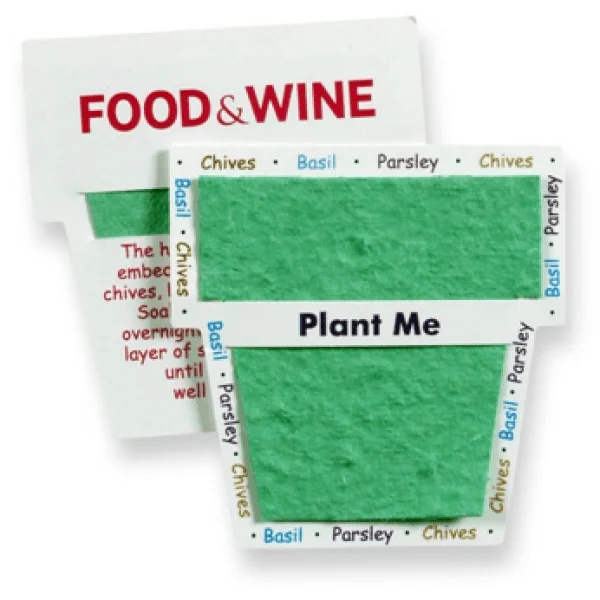 With the ability to add custom messages that promote environmental consciousness and enhance the image of your company, Seed Paper Shape Tags are a great investment for any business that deals in selling and distributing products. 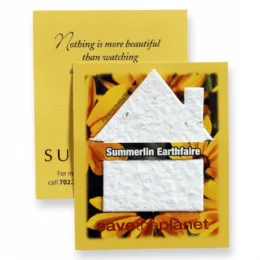 Seed paper tags from Custom Earth Promos are a great way to win over the favorable sentiment of customers, keeping them reminded of your environmentally ethical initiative with a beautiful wildflower garden. Instead of throwing them away, customers plant seed paper shapes in their flowerbeds or lawns. With the highest germinating seeds and a process carefully monitored to ensure seed integrity is maintained, we proudly guarantee seed paper will bloom. Customers that plant their product tags and provide adequate care will soon have a daily living reminder of your eco-friendly brand in the form of bold and colorful wildflowers. Custom Earth Promos proudly presents our attractive range of handmade Seed Paper Shape Tags. The seed paper used for these eco-friendly tags is created from 100% post-consumer recycled paper that is then infused with an assorted mix of high-quality wildflower seeds. Our seed mixes are comprised of the best quality available, as we use only USDA-approved, non-GMO seeds with the highest possible germination rates and guaranteed to grow in any US Climate Zone. Seed paper is manufactured at our 30 kW solar powered facility in the USA. We use only all-natural, soy-based ink and a proprietary process to ensure seed integrity isn't compromised during production. We offer offset, digital, inkjet, and letterpress printing options. As each method produces unique results, our in-house design experts will consult with you on which method will best suit your choice of imprint design. Imprints are done in high resolution and full color to produce eye-catching results. Add imprints of your company name and logo or customize with a custom message, brand slogan or eco-conscious initiative. Complement your graphic imprint with choice of seed paper shape, color, and even custom seed mix. Our wildflower seed mix includes seeds of English daisy, scarlet flax, baby blue eyes, spurred snapdragon, five spot, and many other wildflower seeds. You can choose to keep this popular mix, guaranteed to grow in any US Climate Zone, or choose to develop a custom seed mix with one our experts and given the option to use one of our existing specialty or seasonal mixes, such as "Evergreen Mix" for winter or the "Hope Mix" of pink annuals and perennials to support breast cancer awareness. Additional custom options include add-ons like ribbons and metal eyelets as potential methods of attaching these tags to your products. Orders come with one side of full-color printing. 2 sided printing option available.